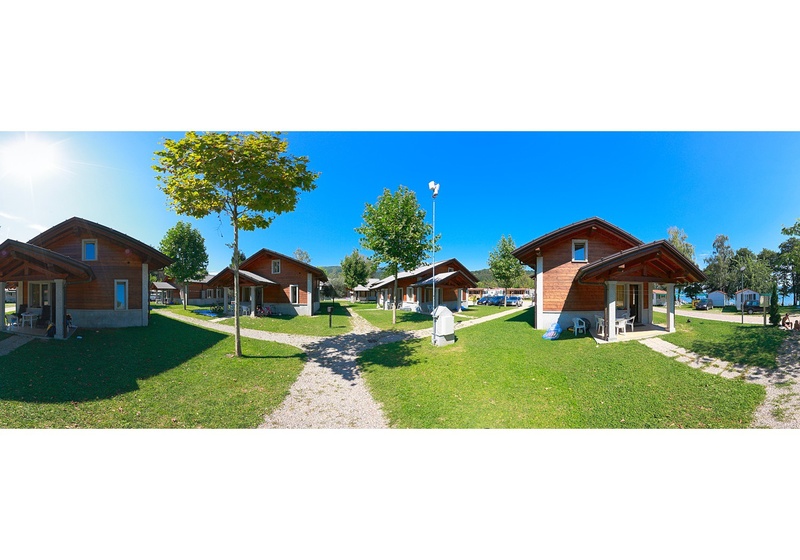 Situated along Maggiore Lake in the town of Fondotoce di Verbania, Isolino Camping Village extends over a surface of 150.000 m2 and establishes itself as the ideal destination for families travelling with children seeking high-quality services, a strategic position and tidiness. Here guests will find shaded and spacious pitches provided with water and electrical connection as well as sat tv that are served by restrooms with baby-room, free hot showers, token-operated washing machines and tumble dryers. Those seeking the utmost comfort will benefit from bungalows and apartments able to accommodate up to 6 persons. Units are almost all equipped with air conditioning, a furnished kitchenette, a bathroom with shower, a furnished balcony and veranda and at times also a safe deposit box, a microwave, an American coffee machine, a Sat Tv and a dishwasher. Mobilhomes offer all the freedom of a camping as well as the comfort you would find in a small house. Available in various types, they are able to host up to 6 persons and feature air conditioning, a kitchenette, a bathroom with shower, Tv Sat, a microwave, an American coffee machine and a furnished external patio. Isolino Camping Village looks out over a nice sandy beach, much appreciated by children because of a slightly sloping sea bed. Alternatively, guests can lie either on a grassy or pebble beach. Water sports enthusiasts will have a chance to hire kayaks, SUP equipment and pedalos. Much appreciated by families is also the water park, open between Mid-April to Late September and equipped with an adults and childrens pool, water games and slides. Located in a panoramic position, the restaurant-pizzeria proposes typical specialities coming from the Italian tradition as well as a baby meal. Besides customized discounts, children are also provided with a playground and an entertainment staff that regularly arranges several sports and recreational activities throughout the whole day. Apart from the Mini Club, our entertainers organize sports competitions to everyone, games, group classes and evening shows. Sportsmen will definitely enjoy our tennis and football fields, teqball table, table tennis, spinning room, bike tours arranged by the camping staff. Nearby are also golf, tennis courts, stables, adventure parks, thermal baths and hiking trails.